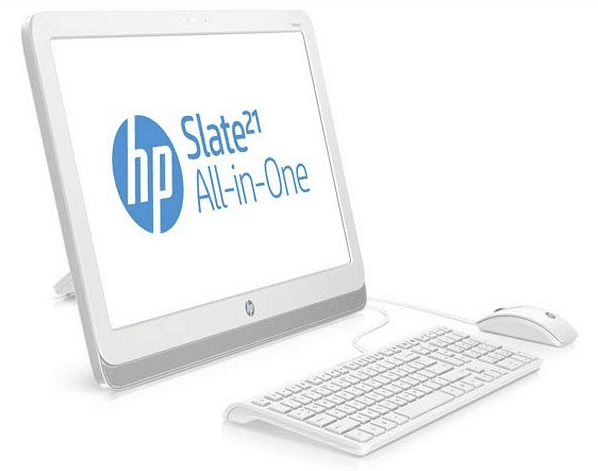 This 21-inch All-in-One portable is running Android 4.2.2 — wait, Android on a portable 21-inch tablet/desktop computer? Check it out. The device, which HP has announced at the HP World Tour event in Beijing, is powered by an Nvidia Tegra 4 CPU and has a 21.5 inch touchscreen. You’ll be able to use it to run apps, as well as play games, as the Nvidia CPU is pretty appropriate for that. 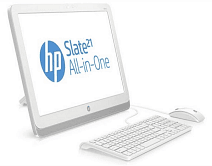 The 21.5 inch display is a Full HD, and the device also has built-in dual speakers, making the Slate 21 a pretty good device for watching multimedia content together with your loved ones. The most interesting part is that the device only runs Android 4.2.2, but it doesn’t dual-boot it with Windows 8, like Samsung’s new ATIV Q does. Another shot, which you can take a look at below, shows the AIO with a keyboard and mouse attached to it. This can only mean that HP is putting its money on Android as a desktop OS, which some might say it could be quite a gamble. However, with the the large number of apps available for Android at the moment, allowing you to do most of the basic things you could do on a Windows PC or Mac, that doesn’t seem a mistake. I mean, it may not be an option for advanced users, but it should be more than enough for a family PC. It will do the things most people want to do with their devices, like watch movies and TV, browse the web, Skype, play video games, or check email. It’s most certainly not too mobile, and I wouldn’t see many people walking around with it, but it could be pretty good for the uses mentioned above. I’m pretty curious to see how Android feels on such a huge display. HP has not announced pricing or availability yet, but promises to do so when this monster gets announced in each country. UPDATE: according to The Verge, the device will cost $399 and won’t include a battery, so you’ll only be able to use it as a desktop device.